The Leonardo da Vinci school is situated in the historic medieval centre of Siena. Located in an historic building, the school is situated particularly well, between historical monuments, museums, shops etc. The warm atmosphere of our school will make you feel at home and you have access to our large classrooms and sunny terrace where you can meet your friends. There is also an administration office in the school. Our staff are always at your service for any question or any information about Siena and its surroundings. You can use the Internet without charge, to contact your family and your friends. In Siena, classes have a maximum of 12 participants! Students who have studied for 3 consecutive months (12 weeks) in our school should be able to pass the DILI intermediate exam of the Accademia Italiana di Lingua. After 6 months of consecutive studies they will be should be prepared for the DALI advanced exam. The school secretary is at the service of students for every information. The school staff is available for any questions you may have regarding your stay in Siena. Common room where you can meet with your fellow students. Provided is a machine for coffee, tea and hot chocolat. Free Internet access at a local internet point that is open from 10:00am to 8:00pm Monday through Friday, and from 10:00am to 7:00pm on Saturdays. Free receipt of faxes. Faxes can also be sent from the school for a fee. Founded in 1991, we have years of experience and specialise in teaching Italian in Italy. Great location in the centre within easy walking distance of the city's attractions and public transport. 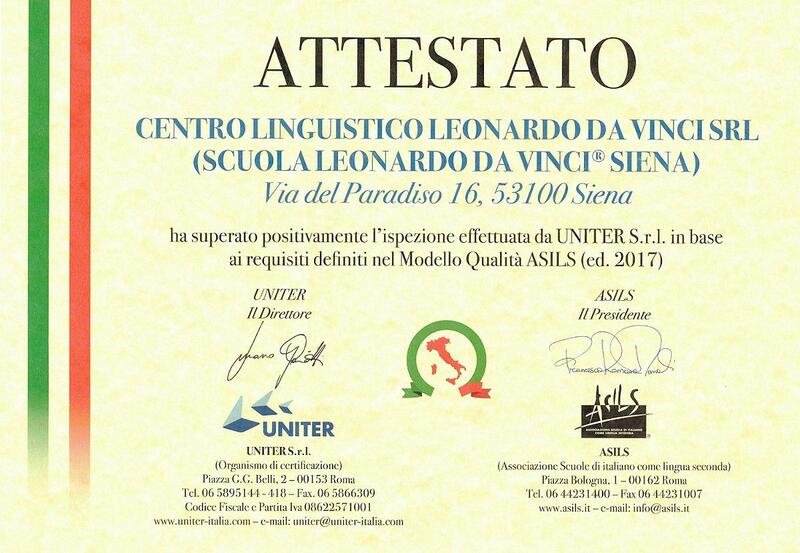 Our Italian School in Siena has obtained the International quality assurance Certificate ISO 9001:2008, as a quality school of Italian language for foreigners, and has regular inspections to ensure that high standards are maintained. Professional and young teachers all of whom have studied at the University level and who have been specially trained in teaching Italian to foreigners. Recognised by the State University of New York at New Paltz with undergraduate credits.